Behind the visitor centre, the car park and the former Convent of Mercy, the Dovecote almost goes unnoticed by the stream of tourists visiting Adare, Co Limerick, during the summer season. The dovecote was rebuilt around 1850, but is probably 500 years older, dating back to the mid-14th century, which makes it almost contemporaneous with the great monastic foundations in Adare. This dovecote or columbarium forms a group with the former Trinitarian Abbey to its south-east, which was founded in 1226. 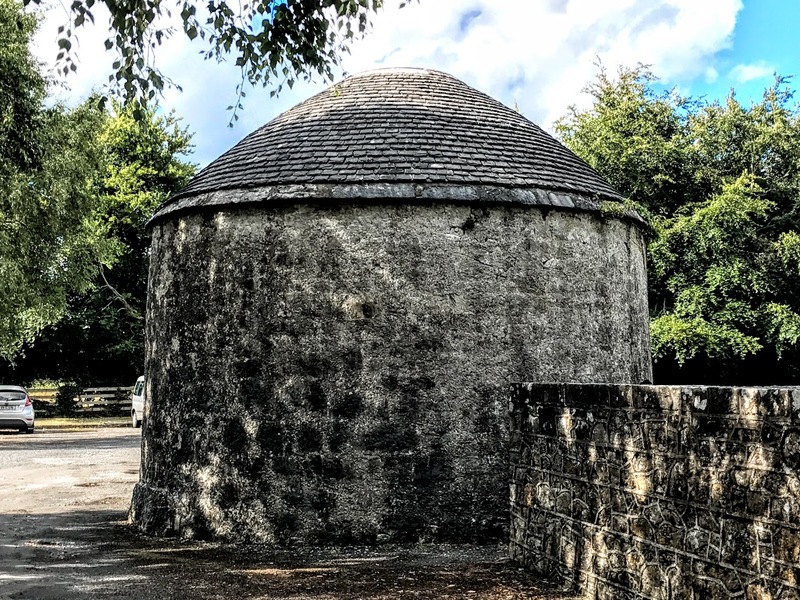 The dovecote is almost 700 years old, dating back to the mid-14th century, making it almost contemporaneous with the great monastic foundations in Adare. The dovecote was used by the Trinitarian monks in the nearby abbey to house doves and pigeons that provided them with food. The domed, circular, dovecote was rebuilt around 1850, but incorporates the original fabric of a much earlier building that dates from around the 1350s. It has a cut stone eaves course and rubble limestone walls. There is a camber-headed opening with cut-stone voussoirs and a cast-iron gate. There are no windows in the building, but the birds could enter the dovecote through an opening in the roof, while the walls inside are lined with square-headed recesses or niches the provided them with nesting space. A door at ground-floor level was used as an entrance for the monks. The circular plan enabled squabs (young doves or pigeons) to be collected from the nesting-boxes by a ladder attached to a revolving pole with arms, known as a potence. For centuries, doves and pigeons were a valuable source of meat, manure and feathers for mattresses and pillows. In mediaeval Europe, the possession of a dovecote was a symbol of status and power. So, in the Middle Ages, only manorial lords could keep these birds, and the few remaining mediaeval dovecotes are connected with manor houses, castles, parsonages or former monastic sites. Other mediaeval monasteries in Ireland known to have had dovecotes include Saint Mary’s, which had two, Mellifont, which had four, and Kilcooley, which had at least one. I am told there is an unusual triangular-shaped red-brick dovecote with oval windows set in brick surrounds at the rear of No 96 O’Connell Street, Limerick, now the offices of Limerick Chamber of Commerce. The laws relaxed after about 1600, so many later farms had dovecotes, until their use declined after the 18th century. Dovecotes ceased to be a matter of pride, and became socially unacceptable. Many were demolished, others were allowed to fall derelict. In some Dovecotes, the pigeon entrance was blocked and they were often converted for other purposes such as stables, granaries and cider houses. 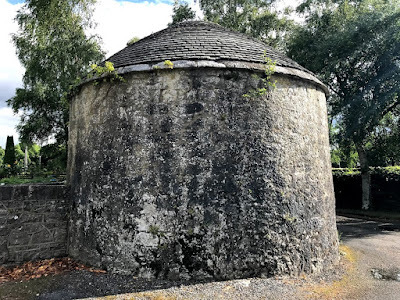 The dovecote in Adare fell into disuse after the dissolution of the Trinitarian Abbey with other monastic houses at the Reformation in the 16th century. The ruins of the Trinitarian Abbey were given by Windham Henry Quin (1782-1850), 2nd Earl of Dunraven, as a gift to his Roman Catholic parishioners in 1824, when he initiated a programme of restoration that was continued by his son and successor, Edwin Richard Wyndham-Quin (1812-1871), 3rd Earl of Dunraven. The English architect Philip Charles Hardwick (1822-1892), who worked on Adare Manor from 1850 to 1860 was employed to restore and enlarge the church while taking care to maintain the fabric of the historic building, and Holy Trinity Abbey Church became the Roman Catholic parish church in Adare. As part of the restoration project, the Dovecote in Adare was rebuilt around 1850, and remains a reminder of the eating habits of mediaeval monks – a far call from the chocolates in the chocolate box covers that could easily be inspired by the thatched houses on the Main Street in Adare. For a visit to the dovecote built by Sir Richard Bulkeley of Beaumaris in 1600 at the monastic site in Penmon, Angelsey, see HERE; for the dovecote beside the Bottle Tower in Churchtown, Dublin, see HERE.